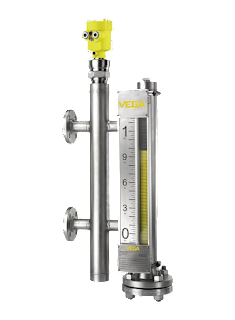 Magnetic liquid level gauges are an excellent alternative to sight glass level gauges for many process measurement applications. Their reliable performance and adaptability to process requirements has made them a primary choice in the industrial arena. Essentially, a magnetic level gauge or magnetic level indicator, is a sight glass with enhancements that provide better readability and a form factor enabling the inclusion of additional level monitoring functions on the same device. Where a sight glass requires operator proximity to read liquid level, the magnetic level gauge's indicating scale, or flags, can be clearly viewed from a considerable distance. A sight glass gauge can also be hindered by difficulties in visually determining liquid level because of deterioration of the glass surface or physical properties of the liquid. Magnetic level gauges remove the need to observe the liquid directly by incorporating a float device within a tube connected to the liquid containing vessel. As the float moves in response to liquid level changes, its magnet causes the indicator flags on the scale to rotate and display either a black face, indicating no liquid present at that position, or a colored face. Magnetic level indicators or gauges can be modified with a range of options, including armored casings to protect the tube and float arrangement and limit switches to signal attainment of predetermined liquid levels. Combining a magnetic level indicator with another level measurement technology, such as guided wave radar or magnetostrictive, in a single assembly can provide an analog process signal representing continuous liquid level and serve as a redundant measuring device for critical applications. The document included below provides illustrated detail about the devices and their proper application. There is more detail available, so share your process measurement requirements and challenges with instrumentation experts. The combination of your process knowledge and their product application expertise will produce effective solutions. Combination magnetic and guided wave radar liquid level indicator from Classic Controls, Inc.